Congratulations to Dr. Carla D. Savage, professor of computer science in the NC State Computer Science Department, on being named a Society for Industrial and Applied Mathematics (SIAM) Fellow, Class of 2019. Savage is being recognized for outstanding research in algorithms of discrete mathematics and in computer science applications, alongside exemplary service to mathematics. Members were nominated for their exemplary research as well as outstanding service to the community. Through their contributions, SIAM Fellows help advance the fields of applied mathematics and computational science. In 2012 Savage was invited to join the inaugural class of Fellows of the American Mathematical Society (AMS). 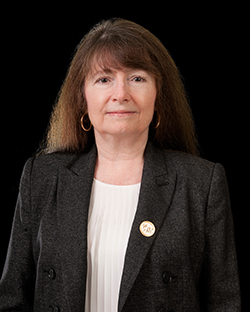 In 2013 she was named Secretary of the AMS, becoming only the 10th secretary in the organization’s 131-year history. Savage received her BS in mathematics from Case Western Reserve University in 1973, and her MS and PhD in mathematics from the University of Illinois, Urbana-Champaign in 1975 and 1977, respectively. Her research interests lie in combinatorics, enumeration and structure in combinatorial families, theory of partitions, linear Diophantine enumeration, lattice point enumeration, permutation statistics, and the combinatorics, geometry and number theory of lecture hall partitions. Savage joined the NC State Computer Science Department in 1978. For more information about the SIAM Fellows program, click here. For a complete list of the Class of 2019 Fellows, click here. For more information about Dr. Savage, click here.